No Fat Or Cholesterol! Highest Value, Most Advanced Protein Formula! 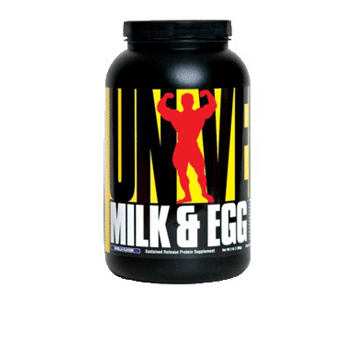 Universal's premium Milk & Egg Protein offers you one of the most advanced, highest quality protein formulas. Designed for serious bodybuilders and competitive athletes, this cutting-edge, low-fat formula gives you high-value protein and essential nutrients for fueling gains of solid muscle mass. Universal's Milk & Egg Protein is formulated from carefully selected high-quality, premium protein sources (including calcium caseinate, lactalbumin, and egg white albumin). Milk & Egg Protein is loaded with essential vitamins, mineral and electrolytes. Plus Universal's Milk & Egg Protein contributes greatly to the promotion of a positive nitrogen balance within your body. * As a great-tasting shake, Universal's Milk & Egg Protein is formulated to be easily-digestible and readily utilized by your body. * To optimize your gains and prevent catabolic effects schedule protein feedings every three hours.